A student-inspired free clinic that serves the at-risk population of Lubbock, Texas. Our patients have neither health insurance or a primary care physician. The clinic has an inter-professional mix of volunteers which includes community physicians, nurses, pharmacists, and social workers as well as Texas Tech Health Sciences Center medical students, nursing students, pharmacy students, and Texas Tech University social work students and pre-med undergraduates. We focus on providing primary care but we also host an occasional specialty clinic. Since opening its doors, the clinic has treated over 4,000 unique patients in more than 7,000 patient visits, averaging 25-30 patients a week. Uninsured patients 18 and older from low-income backgrounds are seen based on severity of condition. 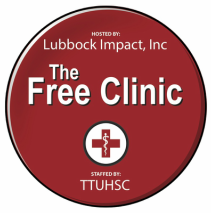 The Free Clinic is helping to close the healthcare gap in Lubbock, Texas. Lubbock Impact is a non-profit, faith-based organization run by the people of the Lubbock community. Any and all are welcome, regardless of their beliefs or status. Its supporters consist of individuals, businesses, churches, and organizations throughout the community that desire to help those in need. The Lubbock Impact organization is committed to providing services to people through all possible means it can. Currently, they support a medical clinic, dental clinic, food pantry, childrens' programs and clothes closet. They also run a soup kitchen that serves 250 patrons every Wednesday night and people in need of food vouchers can also find support here.